Make all your Christmas cards this year. 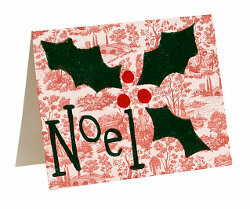 Send all your friends and family noel holly cards. Using cardstock and acrylics you can make these cards in four easy steps. Make many of them for everyone. Print off or trace pattern onto cardstock paper; cut out leaf shapes with craft knife. Holding edges of stencil when stamping, dip pouncer into Hauser Dark Green and pounce over leaf patterns; carefully lift off stencil and let paint dry. Refer to photo for placement and use end of brush handle dipped in Tuscan Red paint to paint large dots for berries, moving handle in circular motion. Use liner brush and Hauser Dark Green to paint letters, referring to pattern for placement and size; let dry.